1. In Table, can we set background color which compare category by today and yesterday. - If an activity is happen yesterday and today same activity background will change to red color. - If an activity not happen yesterday and just happen today background will change to oren color. 2. It is possible when we click today date, it will show all today and yesterday activities. For yesterday it only show activity that happen only yesterday(that activity not happen today). - If possible, that background will change green color. Thanks for your questions. I will do my best to assist and others can gladly chime in. For #2 I will see if my colleague might have an idea. jpe‌ - do you have an idea? 1. 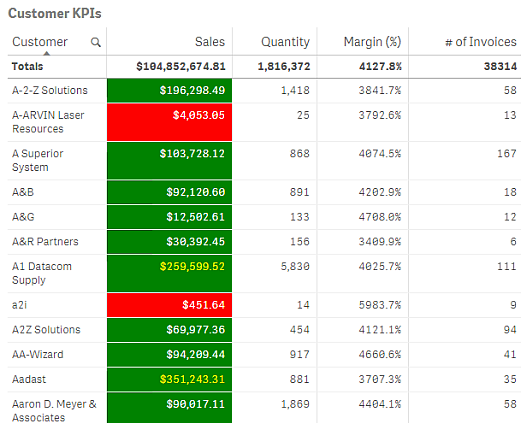 If I am sure you are using Qlik Sense, there is an application which comes by default Consumer Sales, Open it , go to the sheet Sales Analysis then click on the chart Sales By Rep and Customer =.Right Click => Unlink Visualization => Check the measure Sales => Check the back ground Color Expression , Try to replicate it with your desired color. Try to do it with your data. when you learn variables it will be very easy. Here I attached with a qvf file. Here is a start - you put this in the Background Expression for the column you want to highlight. I will look at the other expression next. I created this app (attached) on a newer version of Qlik Sense as I am trying out some features, let me know if it works in your version. If not I will send you another file. I realize this is more involved then the example I sent you, looking into it further. Sorry delay to inform you,. I already tried your app but it not like what i want. In your app, all Activity background in table for today and yesterday will turn red with if (ActivityDate = Today() or ActivityDate = Today()-1,LightRed()) right? 1) If yesterday Activity and today Activity is the same activity, background will be red. Can i do it in qlik sense? Can I change the background color of the null value in the pivot table?